Freight balance matters. A well-balanced load benefits carriers by increasing fuel efficiency and regulatory compliance; it also reduces reloads, benefiting shippers and carriers alike. 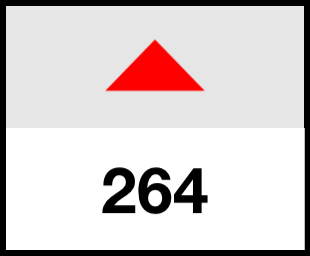 To help balance palletized freight before loading begins, Freight Seesaw estimates the balance point (aka center of gravity, or CoG) of a load based on its pallet pattern and individual pallet weights. Patterns can be entered in seconds. Works for any truckload on same-sized pallets. Exact pallet dimensions must be entered to get accurate results (“garbage in, garbage out”). If you are unsure about the exact pallet size to the inch, measure one pallet with a tape measure. When freight overhang prevents pallets from touching, enter the freight dimension instead of the pallet dimension. Freight Seesaw assumes that each pallet’s weight is centered on the pallet. This is usually the case. If it is not, then do not use Freight Seesaw. Freight Seesaw does not measure gross vehicle weight or replace scaling. It only takes a few trials to hone in on the best CoGs for your equipment. 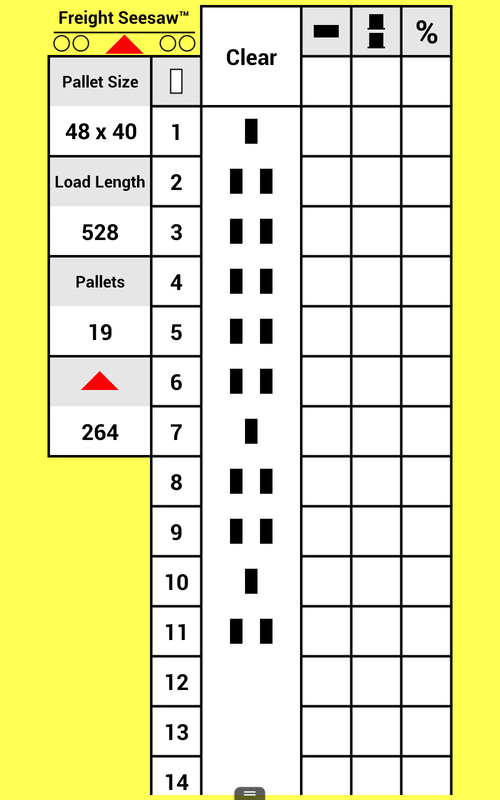 Anytime you pick up a palletized load heavy enough to scale, enter the pallet info in Freight Seesaw to calculate its CoG (tip: start with loads that have identical freight on every pallet). If the drive and trailer axles scale about the same, this is a good CoG for your rig; if the drive axles scale a lot heavier than the trailer axles, it is too low; if the trailer axles scale a lot heavier than the drive axles, it is too high. Freight Seesaw displays CoG in the same units as pallet size. Users outside of North America should use 2 cm instead of 1 inch as the base unit. The calculation Freight Seesaw performs is based on time‑tested physical principles discovered by Sir Isaac Newton hundreds of years ago. For those familiar with physics, a good technical discussion can be found here. DISCLAIMER. Freight Seesaw is offered as is without any warranties, explicit or implied. The developer will not be held responsible for any damages or failures of any kind associated with its use, including but not limited to: reloads, overweight citations (of any kind), hardware malfunctions, inaccurate data entry, or failure to understand what the app does. © 2019 mathematrucker. Apple and the Apple logo are trademarks of Apple Inc., registered in the U.S. and other countries. App Store is a service mark of Apple Inc. Google Play is a trademark of Google Inc.